SkyTruth – July 26, 2031: Yesterday, the runaway gas well at the Hercules 265 jackup drill rig in the Gulf “bridged over” – essentially choked itself with sand, rock and other debris – shutting off the flow of natural gas, extinguishing the fire that had been burning since Tuesday night. Here is a post-fire photo of the rig. The small production platform it had been working at is a total loss. The jackup itself has sustained plenty of damage but it looks like much is still salvageable. And a very small slick is visible next to the rig. UPDATE: On July 25, the well “bridged over” and the fire is now out. Hercules is expected to drill a relief well to completely kill the run-away well. See the most recent update from GMC member SkyTruth here. July 24, 2013 @ 3:58 pm – Around midday yesterday, (Tuesday, July 23) a natural gas blowout occurred at a jackup drill rig, the Hercules 265, operating in shallow water in the Gulf of Mexico off the coast of Louisiana (South Timbalier Block 220). All of the workers — more than 40 — were safely evacuated. The rig, operated by Hercules Offshore at a well owned by Walter Oil and Gas corporation, was enveloped in a cloud of gas, which ignited around 11 pm last night and as far as we know, remains on fire. So far, official statements have only referred to gas leaking from the well, and a small sheen was reported around the platform – probably a thin slick of highly volatile natural-gas condensate. However, the report submitted to the Coast Guard’s National Response Center identified the material being spilled as “CRUDE OIL” and estimated that “APPROXIMATELY 7 BARRELS AN HOUR” was leaking from the unsecured well. We do not know at this time if this discrepancy is a transcription error from the phoned-in report, or an indicator of something more serious. 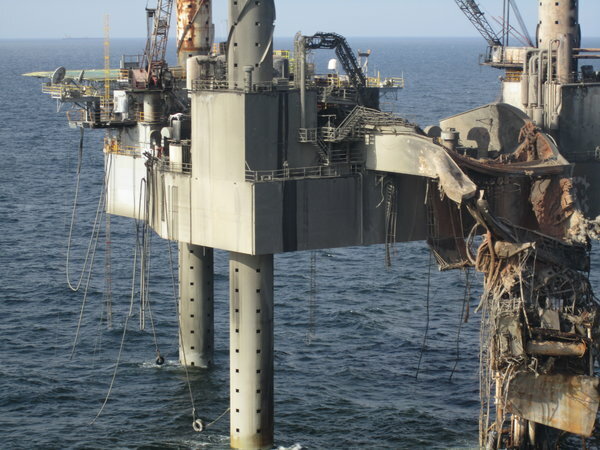 This incident comes in quick succession to another blowout that happened in the Ship Shoal area last week, yet another reminder that drilling is an inherently risky activity. Options for controlling the blowout are now a lot more limited, since the rig can’t be occupied by well-control specialists. Eventually the well might collapse on itself, “bridging over” and shutting off the flow of natural gas. Otherwise a long and complicated intervention might be required, such as the drilling of a relief well — the solution required to kill BP’s runaway Macondo well in 2010, Chevron’s fatal blowout off Nigeria in 2012, and the months-long blowout and massive oil spill off Australia at the Montara platform in 2009. Either way, the rig is certainly a total loss. GMC member SkyTruth saw nothing unusual at the site on yesterday’s MODIS satellite images, which were taken in early afternoon, long before the fire began. Today’s images might reveal more, although if the leak is only gas, we do not expect to see any significant slick on the water. Hopefully, this well is just a gas producer. Otherwise the situation could be gravely worse, from an environmental and economic perspective. We have questions, as usual: Was the blowout preventer (BOP) engaged? If not, why not? If so, why did it fail to do its job? Should federal regulators speed up the implementation of new BOP standards? Would these new standards have addressed the problem in this case? Crude oil leaking from Taylor Energy’s damaged well stretches from the source to the horizon in this photo taken on a Lower Mississippi Riverkeeper/Gulf Monitoring Consortium monitoring flight which was provided by SouthWings. New Orleans, LA – Yesterday, the judge in a lawsuit (Apalachicola Riverkeeper v. Taylor Energy Co. LLC) brought against Taylor Energy for a leaking oil well issued an order denying most of Taylor Energy’s Motion to Dismiss and denied Taylor’s Motion to Stay the lawsuit. The Clean Water Act lawsuit was brought by Apalachicola Riverkeeper, Louisiana Environmental Action Network on behalf of it’s Lower Mississippi Riverkeeper program, and Waterkeeper Alliance in an effort to stop Taylor’s oil discharges of crude oil into the Gulf of Mexico. Three claims by the plaintiffs said that 1) Taylor violates the Clean Water Act by discharging oil without a Clean Water Act permit, 2) if Taylor somehow has a Clean Water Act permit, Taylor is violating that permit; and 3) by discharging oil into the Gulf, Taylor is disposing of waste and causing or contributing to a situation that may pose an imminent hazard to the public or the environment. The Judge dismissed the second claim because Taylor has now admitted that it has no Clean Water Act permit for discharge of oil. Aside from that, Taylor has lost its motion and Waterkeepers will move forward with the lawsuit. Waterkeeper Alliance is a founding member of Gulf Monitoring Consortium, a rapid response alliance that collects, analyzes and publishes images and other information from space, sky, and the surface to investigate and expose oil pollution incidents that occur in the Gulf of Mexico. Gulf Monitoring Consortium has been pivotal in identifying and documenting the ongoing Taylor leak. 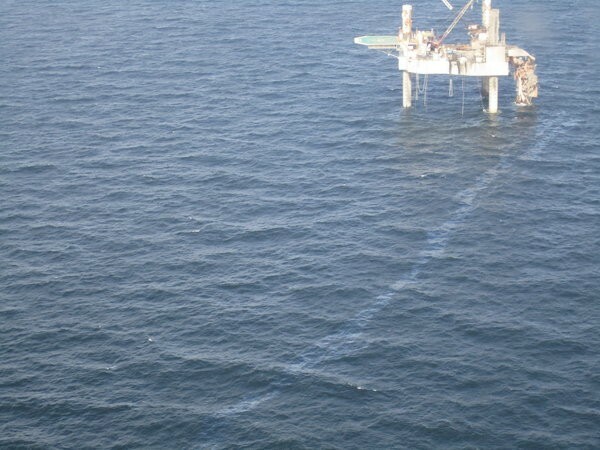 Oil leaking from Taylor Energy’s well snakes past an unrelated platform in this photo taken on a Lower Mississippi Riverkeeper/Gulf Monitoring Consortium monitoring flight which was provided by SouthWings. An underground mudslide began this spill on about September 15, 2004, by destroying a Taylor drilling platform in the Gulf of Mexico and burying up to 28 wells. Without details about Taylor’s response to this crisis, it is impossible for members of the public to assess the risk that similar events will cause additional multi-year spills, including spills from higher-pressure wells in deeper water. Because such spills may damage the Gulf’s eco-system on a scale comparable to or exceeding that of the BP spill, it is essential that the public learn from the 9-year Taylor response. The following day, on July 8th, ERT again reported that at 7:00 am they had spilled 4.2 gallons of crude oil “DUE TO EQUIPMENT FAILURE WHILE PLUGGING THE WELL.” The caller reporting the spill estimated the sheen was 450 feet wide by 0.3 miles long (16.36 acres). At 6:45 am on July 9th, a passing aircraft reported a much larger sheen to the NRC – 200 feet wide by 5 miles long (121.2 acres). As of July 9, the most recent reports from USCG state that platform personnel had been evacuated and federal agencies are monitoring well-control and pollution response activities. Gulf Monitoring Consortium member SkyTruth reports that cloud cover in the Gulf has impeded observation by satellite, but will continue to monitor reports and available satellite imagery. This report will be updated as needed with new information and images. SkyTruth – July 2, 2013 : Following a recent cluster of “conflicting reports” of oil-slicks observed around the wreckage of former Taylor Energy platform #23051, the Times – Picayune of New Orleans ran an article yesterday on the almost nine-year saga of ongoing pollution from the damaged wells. On June 18th and 20th, GMC member SkyTruth reported a larger than usual discrepancy between the reports from Taylor Energy’s contractor who flies the site daily, Marine Pollution Surveillance Reports by the National Oceanic and Atmospheric Administration (NOAA), and SkyTruth’s own analysis of the satellite images from NASA’s Terra and Aqua satellites. On most days, the aerial inspection by Taylor Energy finds an oil sheen, and its dimensions are repo[r]ted to the Coast Guard’s National Response Center. On June 18, according to the report, that sheen was a bit larger than normal: 10.1 miles long and 200 feet wide, and contained 3.84 gallons of oil. But on that day, NOAA’s National Environmental Satellite, Data, and Information Service spotted the same slick from space, using NASA’s Aqua satellite. Its estimate, also reported to the center, was that the slick was 30.5 miles long and 2.5 miles wide. That report contained no estimate of the amount of oil. While the Unified Command disputes our numbers, SkyTruth has always been consistent and transparent about how we calculate our estimates, (see here from the early days of the BP spill) and exactly what assumptions we use. We are very interested in how Unified Command and Taylor’s contractor calculate their reports, given that it has been flown multiple times by other groups, especially Bonny Schumaker from On Wings of Care, who consistently reports a slick much larger than what Taylor’s contractor reported on the very same day. June 20 – Responsible Modern Offshore Drilling. Except When It Isn’t.